After a little bit of a hiatus we are back in the video editing groove and have a fresh tip for all you Battlefield 3 fans out there. 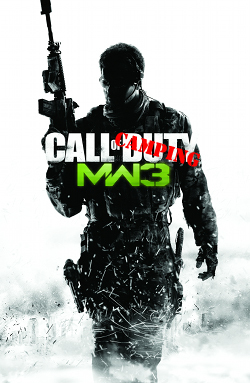 Hopefully this even grabs the attention of some of the Call of Duty fans that want something with a bit more scale. Either way it goes, we have some quick tips for you in how to bring down aircraft more effectively in Battlefield 3 using the Engineer Class and the Anti-Aircraft ‘Lock On’ Missiles. You will need either the Stinger or the IGLA (depending on which side you are fighting for in multiplayer). Check the video to have a walk-through of how these work best. We will be posting more videos with a focus on the engineer class in the coming days and look forward to doing a focused feature on why it is one of the best classes to use as an aggressive gamer with a penchant for destruction! BE SURE TO CHECK OUT UPDATES ON CONNECTED CAREERS!!! As of next week (June 4) there is going to be a new blog released from EA Tiburon that is going to focus on ‘Connected Careers’. The most important part of this for Madden fans is the hope for details about Madden’s Franchise Mode and what improvements or additions have been made. It would be simple (in theory) to just add player morale to the player traits section. It shouldn’t be an editable value, but making it a dynamic value that fluctuates is a must for Franchise Mode immersion and longevity. Making it to the Super Bowl with a team like the Browns more than once but having the same banner showing that it is their first trip. Being able to sign Free Agents for much cheaper by going to the “Free Agent” section rather than “Player Management” (where you have to pay players a more realistic salary instead of cheating them with a 1-year $620 deal for a guy that would/should demand more. Draft logic and trade logic is still busted as we covered before. The lack of a decent system of Player Value that should mean you have to pay a player based on his performance rather than just his OVR. If you have a QB that breaks every record (regardless of your sliders, his OVR or anything else) he should have a high value that essentially equates to you having to pay more to keep him around. The current system of OVR plays too much of a role and takes much of the focus away from the Skill Ratings which should be the first thing you look for. Another missing component that has been in NBA 2k and even PS2 Madden titles is morale and attitude for players. This is something that MUST be in Madden in order for Franchise Mode to really hold any water past what it can hold currently. Franchise Mode needs more personality and that should start and end with the personality of every owner, GM, Coach and Player in the game. If you draft a QB in the first round like the Browns did with Old Man Weeden and you have Colt McCoy being relegated to back-up his morale should take a major hit. Trade Demands and Holdouts – Take a look at the current situation with Drew Brees and tell us that this shouldn’t be in the game. 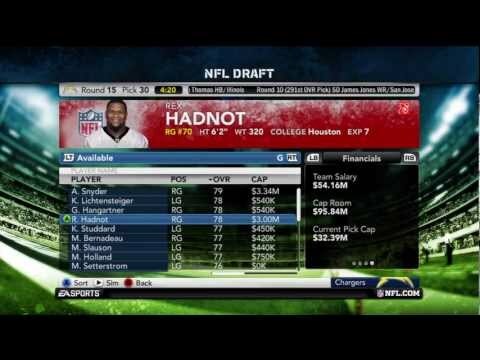 These are just some of the changes that must occur in Madden 13 for Franchise Mode. This holdout (which involves Brees and the Saints disagreeing on a contract extension because of a few million bucks) must end soon if the Saints hope to save any face in the months following Bountygate. Brees led this team to their only Super Bowl Championship and now is being jerked around like he was simply a role-player. Without Brees the Saints would be like the 2011 Colts without Peyton Manning (or worse). Already, they are without their Head Coach and other major personnel. The worst part really involves the current interaction between interim-Head Coach, Joe Vitt and Brees. This isn’t Vitt’s team. This is something that must be made abundantly clear between the players (especially Brees) and the ownership. Payton is serving a one-year suspension which really makes Vitt look like the guy that comes into a broken home and tries to lay down the law. The response from the players (his children) will most likely result in some sort of “Your Not My (Real) Dad!! !” interaction. To make it short, the situation with the Saints this year could result in a Top-10 Draft Pick next year that will take over for a spiteful (rightfully so) Drew Brees. This once again begs the question – Where is the personality in Madden’s Franchise Mode? Hopefully we find out on Tuesday.